I'm sure I'm not the only one this has happened to: you receive a new book for review from someone you genuinely appreciate as a person, friend, blogger or writer... and, after reading through, you realize with a sinking feeling there's simply no way you can write a positive review in good conscience. Let's face it: the writing world, and especially the indie writing and publishing world, is full of exaggeratedly flattering, contrived, fake glowing reviews by people who have chucked good conscience out of the window. When not given by friends and family (who, after all, have a natural claim to partiality) these are often penned by fellow writers acting on the principle of "review mine and I'll review yours". Reviews are so very important to peaking readers' interest, getting a book out there and, ultimately, to book sales, that there's no wonder indie authors are scrambling for them. I'd like more reviews as much as anybody else, and I see the importance of networking and being nice to other indie writers as much as anybody else, but I refuse to gain my point by chucking my integrity aside. Neither will I caper around in a clown's suit, waving pom-poms and chanting, "Buy my book! Review my book! Promote my book!" To do the trick, reviews have to be genuine. They must be disinterested, offered by people who don't expect to gain any favors by writing them. When I browse through a book's reviews, a few 4-star comments saying, "this is a good read, but I wish the author had done so-and-so differently" gain my trust as a reader a lot more than a host of glowing 5-star reviews that all go, "OMG, this is genius! Best book ever! Should be made into a blockbuster! Better than Stephen King/JK Rowling/ whoever is the king or queen of the genre". So what, in my opinion, should conscientious writers do about reviews to keep them helpful and genuine? 1. Never commit in advance. There are many reasons not to review a book, something as obvious as genre being one of them. For example, I find it too emotionally trying to read Holocaust-themed books. I have read many of them in the past, but now they simply unsettle me too much. 2. Don't feel obligated to put yourself forward as a critic (unless you don't mind people hating you). You can read a book and decide it really isn't up to scratch, but it doesn't mean you should go ahead and deal a lethal blow to another writer's self-esteem (unless you are specifically asked for your opinion). And sometimes, what can be fit for a private comment would be unnecessarily cruel in a public review. 3. Don't be tempted to enter a "review for review" practice. It's beyond pathetic. I don't mean a case when two writers begin networking, get to know and like each other's work, and disinterestedly review each other's books. That's completely legit. I mean cases when complete strangers approach each other on forums or the social media, swap review copies, each skim through each other's work and each give each other an, "OMG, this is genius...", etc. 4. Do your best to reach readers, not other writers. Obviously writers are also readers, but if you reach people who are looking for stuff to read, not for reviews for their own work, you've struck gold. 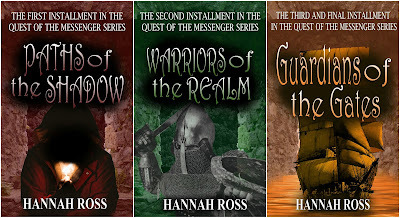 With my fantasy trilogy, Quest of the Messenger, I have the first two books complete on Wattpad, and have put up an excerpt from the third, adding a postscript that people who wish to read it may either buy it or contact me to receive a review copy. In a very short time I have received requests from people who like the genre, like my books, are hooked by the series and want to know how it ends. These are people who are likely to write a positive review for the right reasons, without any manipulation. 5. Be honest. Be real. If a book deserves 5 stars (in your personal opinion), give it 5 stars. If it deserves 3 stars and you aren't sure the writer wants such a review, contact them personally and tactfully ask. Some people would rather have a 3-star review than nothing. Others would rather not have you publish it. Give your words value. Make your expressed opinions matter and cultivate a reputation of professional honesty and integrity. It is a long haul, but ultimately, it will get you a lot farther than contrived reviews. Ever since I was just a kid, I was fascinated with the character of Leif Erikson (Erik the Red's son and the leader of the Norse discovery of America). Actually, fascinated is an understatement. I was head over heels in love with Leif Erikson, reading all I could get my hands on about him (which wasn't much) and writing short stories, novellas and poetry about his life the way I imagined it. I knew I would write a full-length book about him one day. Then, a few years later, I've heard of Tom Holt's Meadowland. At first it was a blow - someone had already written my book! But after I've read it through I realized my perspective is so different that there is still space for the story I wanted to tell. Six years ago, just after my second child was born, I sat down and began writing in earnest. It was a messy job as I constructed hand-written (yes, on actual paper) drafts, incorporated bits from my past prose and poetry, did additional research, typed, added a whole modern-day-spin part and then opted for discarding it. At some point the work ground to a halt and I laid the manuscript aside, satisfied that at least the first rough full-length draft of my book has come into being. Not so long ago I pulled the book out of its virtual drawer and began posting chapters on Wattpad. At the same time I began doing some intensive editing, mercilessly hacking away at the manuscript with the view of getting it in publishable shape. There is a lot of work - awkward sentences, awkward grammar, contrived imagery, paragraphs that do nothing to enhance the story and, of course, lots and lots of typos. The first draft is 130,000 words long and very rambling. I expect the final version will be slightly shorter and a lot more cohesive, though it is still going to be a long and epic novel. My initial reaction as I dove into editing was deep embarrassment. I couldn't believe I was such a lousy writer six years ago! But then I felt a sense of satisfaction, as I knew I've really come a long way (if I do say so myself). Of course, I didn't just sit there twiddling my thumbs, I was busy writing other things. Writing takes patience. This Viking-era book (which I have tentatively titled The Greenlanders: A Tale of Sea and Steel) has walked with me through most of my adult life and spent a lot of time in a hiatus stage. But I do hope that now, finally, I'm going to make it into a good book - or at least a much better and more palatable book than it was likely to end up when I just finished the first draft. Does this mean that six years from now I'm going to look back at what I'm working on today and cringe? I hope not. I do think and hope that, though prolific writers keep on improving throughout their life, there is a certain rapid growth period which marks the difference between literary messes and publishable, readable work. I believe that for me, this period occurred while The Greenlanders lay dormant. It didn't happen overnight, but it did eventually. And now, in this final and hectic stage of bringing the book out, I'm ready to give it all I've got. Recently I've re-read Jack London's timeless novel Martin Eden - which, I believe, is something every writer should do once in a while, counting it as an inspirational story about rising from obscurity into fame as well as a warning on becoming burnt-out, jaded and disappointed. In two senses at least the modern struggling writers have an advantage over Martin Eden - one, we generally don't have to choose between buying either food or postal stamps, as most places these days accept e-queries (on principle, I refuse to contact those who don't. Printing out and mailing manuscripts, especially overseas, is a great deal of trouble, and expecting writers to go through this - especially considering that most of us submit to multiple agencies - is simply unfair and inconsiderate. OK, end of rant); and two, if we query and re-query and run out of places to submit our work to, it's always possible to give one's book a chance by going the indie route. The chance of considerable success isn't very high, that's true, but at least there is still an option for those entrepreneurial authors who are willing to work hard at book promotion and networking. Nevertheless, I do feel a deep sense of kinship with Martin Eden in the way of never having enough time for everything I want to do. Being in charge of three kids, a house, a garden and a bunch of animals is more than a full-time job, so my writing cuts into stuff like recreation, spending time with friends, showers and sleep. Many of my friends are wondering whether I'm still alive and I can't remember the last time I just put up my feet, relaxed and saw a movie. In a recent forum discussion, author Michael Sullivan told he spends "only" 3-4 hours a day writing and editing (this not counting time spent on work-related emails, book promotion, etc). Well, all I can say is Wow! If I have two hours a day together for everything - writing, editing, formatting, querying, networking - I consider myself lucky. And usually those two hours are spread out in snippets throughout the day. Another thing is Eden's motivations. Martin Eden tries to make a living writing so he can give his adored Ruth the future she, in his opinion, deserves. I am trying to earn money by my writing so I can supplement my family's income while still being home for my children (anything more would be fantastic, of course, but for now this modest goal is what I'm striving for). This was what prompted me to try and go public with my work, after many years of accumulating manuscripts in a drawer. All in all, I feel lucky to be living at a time when nobody can tell me I'm not allowed to be an author. Today, anyone's books can see light. Does this mean every published book is a good book? No; does this mean every indie book is a success? Again, no. But there is chance and hope for everyone, and that's worth a million. 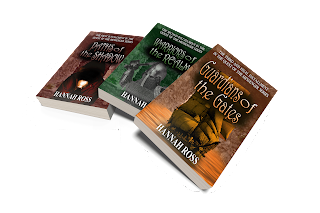 All three volumes of Quest of the Messenger (Paths of the Shadow, Warriors of the Realm, Guardians of the Gates) are now available in a convenient Kindle eBook Bundle for only 4.99$. The trilogy contains close to 1,200 pages and 450,000 words. Each single title is currently priced at 2.99$ so customers who choose to go for the bundle save 4$. I've been meaning to create a Kindle Book Bundle for a while now and have finally quit procrastinating and was spurred on to action by this post. 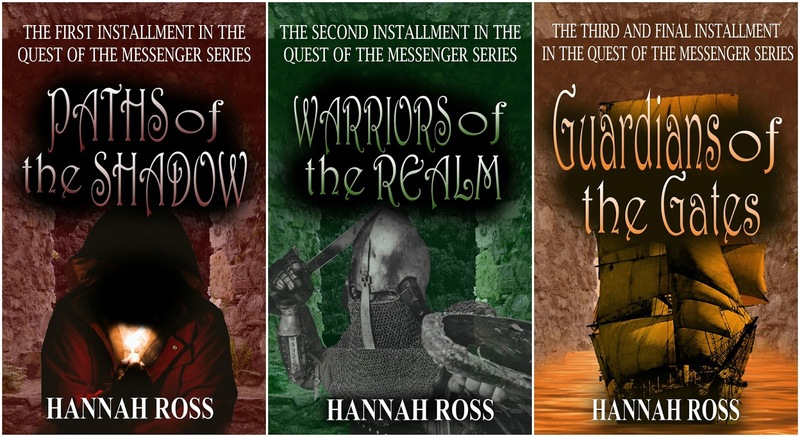 I am quite thrilled about these new covers for the Quest of the Messenger trilogy - updated covers will soon appear on my Amazon page. The cover artwork was done by Katie Cody, a talented designer whom I was very lucky to find. Katie has been amazingly helpful and responsive and working on the covers with her was a true pleasure. You can check Katie's work on her website - there are some great finds in the Premades section for those who are in a hurry. The prices are very flexible too - an important point for an indie author working on a tight budget. I have begun the epic quest of seeking an agent for my first Middle Grade fantasy novel, Tales of Silverbell Wood: A Bride for the Beast, which features dragons, fairies, unicorns and other magical creatures in humorous out-of-the-box settings. After a long, sweet break from querying during which I mostly worked on getting Wild Children ready for publication, together with the team of Mason Marshall Press, I'm in the game again. On the first of this month, I sent my query to eight agents. I will wait one month and if I get no interest, and on January first I intend to send queries to 8-10 more. I will keep at it until I get an agent (or find a publisher who doesn't require an agent, or decide to self-publish). If needed, I will tweak the manuscript and/or query letter, but I won't obsess. Repeat: I won't obsess. Even if this book never makes it out there, in this case I'm already a winner, because I have created a family reading tale which my children have enjoyed at least as much as Winnie the Pooh, Pippi Longstocking or The Chronicles of Narnia. Whenever I slacked off in writing, I got a kid or two pestering me. "Well? When are you going to write more? We want to know what happens when they find the dragon!" And let me tell you, my kids aren't at all afraid to hurt my feelings. When I ask, "what do you think of this?" or "did you like this chapter?" I have to be prepared for honest opinions, which can be as brutal as "this is stupid" or "you should change all of it". So when I had them sitting enthralled and begging for more, it was a huge compliment. It was a reward in itself. Even if I just print one souvenir copy of this book for my children, it's all worth it. Furthermore, one big advantage of writing for children is that children's fiction is, well, short. A Bride for the Beast is 40,000 words, which is a breeze compared to Quest of the Messenger, each book of which contained on average 140,000 words, or soon-to-be-released Wild Children, which will be no less than 100,000 words. I have really, truly, thoroughly enjoyed writing this book. Now I just have to cross my fingers and hope other people will like it as well.